La Liga, Serie A, Bundesliga, Ligue 1: Who will win titles? From managerial changes at some of the continent's biggest clubs to long-running transfer sagas, it has been a hectic summer of activity across Europe. The season has already begun in France, Germany kick off their league campaign this weekend, while Spain and Italy start the following week. So what has changed? Who are the new faces to watch out for and, crucially, what does it all mean for the title races in Europe's major leagues? Very little at the home of the champions - Barcelona's recent presidential elections saw Josep Bartomeu retain power. Luis Enrique stays as coach but, after last season's stunning treble win, would have done no matter who had won the election. The Fifa transfer ban still affecting the club means the stellar cast on the pitch will remain almost identical. The same cannot be said of Real Madrid, with Rafael Benitez returning to the club where he cut his teeth as both a player and coach with reserve team Castilla. President Florentino Perez's decision to remove Carlo Ancelotti from the post was a controversial one and though the squad that starts this season will be similar to the one that ended the last, we can expect tactical tweaks. Gareth Bale has been tried in the number 10 role during pre-season, for example. There is optimism that the clubs below the top two could continue their recent strides in closing the gap. Atletico Madrid's retention of Diego Simeone as their coach means they harbour legitimate hopes of challenging to regain the title they won in 2014. Europa League winners Sevilla arguably have a stronger squad than last year, while Valencia aim to make it a full complement of five Spanish teams in the Champions League in their August play-off. Who have been the major signings? The most striking aspect of La Liga's window is that two of the biggest movers cannot play for the first half of the season. Barcelona's transfer ban means Arda Turan (signing from Atletico Madrid) and Aleix Vidal (from Sevilla) cannot be registered as players until 1 January. This means that Luis Enrique will have two deluxe reinforcements already acclimatised to the Nou Camp for the second half of the season. The goalkeeping situation at Real Madrid is a concern, with everything on hold for the anticipated arrival of David De Gea.Kiko Casilla, signed from Espanyol, does not look to be the world-class number one they need. The arrival of accomplished right-back Danilo from Porto, however, is a boost for the defence. Atletico have considerable firepower at their disposal, having added the prolific Jackson Martinez (from Porto) to replace Mario Mandzukic, while Argentine wonderkid Luciano Vietto (Villarreal) and tricky Belgian winger Yannick Ferreira-Carrasco (Monaco) add to a mouth-watering attack. After a couple of lean years, Sevilla's long-serving sporting director Monchi is hitting it out of the park again, signing coveted Ukraine winger Yevhen Konoplyanka in the face of stiff Premier League competition, and landing midfield enforcer Steven Nzonzi from Stoke. David Moyes has got some eye-catching attacking options in at Real Sociedad with Brazilian hitman Jonathas (Elche) and pacy winger Bruma (loan from Galatasaray). Barcelona. After a turbulent few years at the Nou Camp, stability now reigns. Perversely, the transfer ban is a huge part of that. It's debatable, meanwhile, whether Real under Benitez will be as strong as last season, never mind better. If it is as you were for Barca, things are very different at the team they beat in the Champions League final. Massimiliano Allegri defied the doubters magnificently in his first season in charge of Juventus, and must now do it all again without a clutch of last season's biggest names. Carlos Tevez,Arturo Vidal and Andrea Pirlo have all left but, crucially, Paul Pogba is still in Turin. Fortunately for Juve - and perhaps unfortunately for neutrals - there has been little going on at runners-up Roma to suggest they are ready to close the enormous points gap that existed in 2014-15. Confidence in boss Rudi Garcia was shaken by a poor second half to the season, which suggested psychological damage from the 7-1 Champions League thrashing by Bayern Munich in October. The lack of a centre-forward of suitable authority had been a real concern until Edin Dzeko's arrival from Manchester City, a potential step up after some major recent misses in the transfer market by Walter Sabatini. AC Milan and their city rivals Inter have both invested heavily in an effort to turn their fortunes around. The investment of Thai businessman Bee Taechaubol has given Milan some much-needed working capital for improvements, with coach Sinisa Mihajlovic appointed in Pippo Inzaghi's stead to oversee it. Roberto Mancini, in his first full season back in charge of Inter, will be expected to deliver Champions League football after being heavily backed by owner Erick Thohir. Neither club have European football to distract them. Napoli are also in rebuild mode after the exit of Rafael Benitez, going into a second straight season without Champions League football. Benitez's replacement, Maurizio Sarri, will not make the same sort of transfer demands of president Aurelio De Laurentiis. It will be interesting to see how he applies the aesthetic principles of his Empoli days to a high-class squad. While Bologna make a return to the top flight after just one season away, it's the other two promoted teams, Carpi and Frosinone, that will really pique the interest. Both are going into their first season in Serie A. After their unprecedented rise via successive promotions, Carpi have been forced to move out of their 4,000-capacity Stadio Sandro Cabassi to share Modena's Stadio Alberto Braglia, which is five times the size. Frosinone are led by the division's youngest coach, 38-year-old former Napoli midfielder Roberto Stellone. 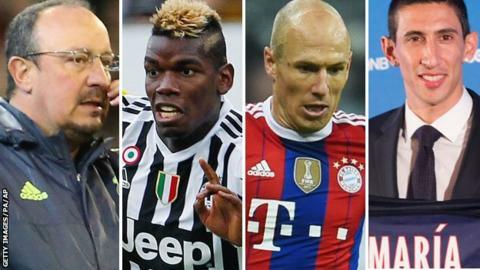 The departures from the Juventus Stadium have meant that the champions have been busy in the marketplace. Juve had already been planning the post-Tevez era last season, tying up the signing of his young compatriot Paulo Dybala from Palermo while we were still in 2014-15. Mario Mandzukic brings a wealth of experience and Allegri has used both in a front three with Alvaro Morata in pre-season. The first "derby" of the season ended in victory for Inter, you could say, with French midfielder Geoffrey Kondogbia opting to join Mancini's side instead of AC Milan from Monaco. Milan have an interesting new front two to spearhead their new era though, with double Europa League winner Carlos Bacca (from Sevilla) joined by the vastly experienced Luiz Adriano, from Shakhtar Donetsk. Adriano was only one goal away from being joint-top scorer in last year's Champions League. Juventus. None of the challengers are wholly convincing. What's really important, though, is that the retention of Pogba, Gigi Buffon, Leonardo Bonucci and company - and the continued growth of Morata and Roberto Pereyra, to name two - will allow the new men to bed in. The Bianconeri should be as formidable as ever. Coaches. While Pep Guardiola and Dieter Hecking (the latter recently voted coach of the year by German journalists) remain in situ at Bayern Munich and Wolfsburg, northern giants Borussia Dortmund and Schalke have brought in Thomas Tuchel and Andre Breitenreiter respectively after disappointing campaigns. If Dortmund and Schalke are aiming to rebuild their reputations, Wolfsburg have the pressure of expectation this time, having wowed with their attacking style in finishing runners-up. Still, stability is their strength after the revolving door policy of the pre-Hecking years. Having diced with relegation danger in successive seasons, Hamburg and Stuttgart must prove to their substantial followings that they have put years of mismanagement behind them. Institutional stability will be the key in both cases, and solid coaching appointments respectively in Bruno Labbadia (at the end of last season) and Alexander Zorniger are a start. Of the promoted teams, champions Ingolstadt can rely on generous corporate backing, but Darmstadt are the real story, having been promoted on a miniscule budget. Die Lilien began last season as one of the relegation favourites in the second tier, and will relish a first crack at the top flight in 33 years after (like Carpi) a second straight promotion. Even before the injury nightmare that blighted the final stages of last season, Bayern's plan was to lower the average age of the squad - particularly in midfield. Arturo Vidal's arrival is obviously the headline and he could make a big difference if he maintains the stunning form he produced for Juve in the second half of last season. The versatile Douglas Costa, bought from Shakhtar Donetsk, can fill in any gaps left by Franck Ribery and Arjen Robben, or could even supplant Mario Gotze centrally. Wolfsburg have aped Bayern with their major signing, simultaneously strengthening and weakening a rival by signing Max Kruse from Borussia Monchengladbach. Gladbach themselves have a good replacement in the more predatory Filip Drmic (from Bayer Leverkusen). Tuchel can count on the experienced Gonzalo Castro (also from Leverkusen) in midfield and the excellent young goalkeeper Roman Burki (Freiburg) for his Dortmund rebuild. He may yet regret losing out on his former Mainz protege Johannes Geis, who joined Schalke. Emir Spahic, released by Leverkusen for fighting with a club steward in spring, brings some much-needed defensive knowhow to Hamburg. Bayern Munich. The club's improvements are mainly geared to giving Guardiola the platform to lift the Champions League at the third time of asking. In the Bundesliga, they are simply in a class of their own. Perhaps the biggest difference to the landscape is the reduced means available to Marseille, the traditional powerhouse of French football. Marcelo Bielsa dramatically quit as coach after an opening defeat at home by Caen, and his successor will have a thinner squad than last season. Mainstays including Andre-Pierre Gignac and Andre Ayew came to the end of contracts that Marseille could not afford to extend, and failure to qualify for the Champions League also forced the sales of Dimitri Payet and Giannelli Imbula. The overall effect is that it is hard to see a candidate to breach the top three of Paris St-Germain, Lyon and Monaco. One thing Marseille do have working for them is the spectacularly redeveloped Stade Velodrome, and they will enjoy their first full season in it. With Bordeaux moving into their own new home in May and Lyon set to play in the 59,000-capacity Stade des Lumieres from January, France has world-class stadiums with which to welcome Euro 2016. There is a fairytale to enjoy in the division too, with Ajaccio's second club Gazelec promoted to the top flight for the first time. It is some achievement, given their meagre €5m (£3.6m) budget last season. They are favourites to go back down, but deserve to savour every moment. Angel Di Maria may have disappointed at Manchester United, but he is a game changer for PSG. If he slots into Laurent Blanc's midfield three, he will completely change the momentum of a side that was often one-paced last season. If he plays in a front three, there is the prospect of him linking with Zlatan Ibrahimovic. There has been huge change at Champions League quarter-finalists Monaco, with 10 players in and even more out, with the club banking €70m (£50m) as they continue to focus on youth. They even have their own galactico in Stephan El Shaarawy, signed on an initial loan from Milan. Still only 22, he could solve their problems in front of goal if he recovers his best form. Runners-up Lyon should be good to watch again, especially with France playmaker Mathieu Valbuena signing. He joins fellow new boy Claudio Beauvue (who scored 27 times for Guingamp last season, bettering club legend Didier Drogba's 2002-03 tally) to form a potentially lethal attack with Alexandre Lacazette and Nabil Fekir. Paris St-Germain. The capital club have a budget more than three times that of any of their competitors, and their squad is better than last season's thanks to Di Maria's arrival. What's more the Champions League involvement of Lyon and Monaco (the latter starting in the third qualifying round) will probably distract them from a concerted domestic challenge.